Though QuickTime is the default media player on Mac OS, it can also be used in Windows and other platforms. The app is a great place to play any video and media clips from personal resource and internet. However, just like many other media players, QuickTime is unable to play your Blu-ray movies. What if we want to watch our favourite Blu-ray movies in QuickTime? Of course, most of us are not about to play iTuness ridiculous prices to watch movies and TV shows we already have on Blu-rays. Instead, we'll just rip those Blu-ray discs to a QuickTime-friendly format. Only comes with some help from third-party software, it can be done effortlessly. To transfer Blu-ray to QuickTime MOV, here EaseFab Blu-ray to QuickTime converter is highly recommended. 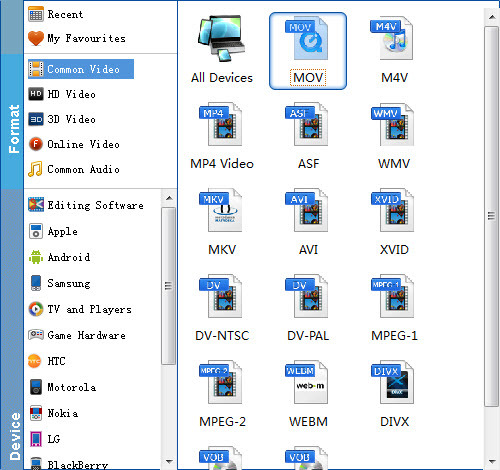 With it, you can rip Blu-ray movies to QuickTime MOV, MP4 or M4V format with fast speed and high output video quality. It's the app which makes it easy to either just watch or convert Blu-ray to QuickTime format in an almost Apple-like way. If you are using QuickTime on Mac (including 10.10 Yosemite), try EaseFab Blu-ray Ripper for Mac to convert DVD format. The process is very straightforward. Pop in your disc, choose an QuickTime output profile (QuickTime MOV, MP4, HD MP4), and click "Convert". Then go get a cup of coffee (conversion takes time). Below are the detailed steps. Click the "Profile" drop down list to select MOV (QuickTime playable format) as the output format. Then click "Output" drop down list to select a proper destination folder for output files if you want to change the current default output folder. Note that you can customize the settings for the output. After all preparations, click the Convert button to rip your Blu-ray movie to QuickTime MOV. When the conversion completes, click Find Target to get the converted MOV files and play them with QuickTime freely.